SCIENTIFIC FACT LEARNED: Not even science can explain those wacky, wacky Japanese. A fruity Ultraman, headshot-activated armor, King Gaywad, tubby Stormtroopers, tokusatsu gore, 80s music video dream sequences, Herena Bonham Cartel, and too ... many ... Jesus ... jokes. The futuristic, warehouse-riddled city of Jesustown is a perfect place, free of crime, disease, and other social problems. But life isn’t as great as it sounds in the city named after my gardener. This messianic burg is ruled by The Parliament led by King Girjev (Yasuaki Honda), a powerful and aloof but unfunkadelic fruitcake dressed in white frilly clothing and angel wings who may be a little off his feathery rocker. He commands an army of ruthless police with a taste for blood and three flashlights for eyes, he lobotomizes anyone who breaks the law or opposes the government, and he is aided by his faithful robot fighter Mikhail (who I can only assume is M.I.K.H.A.I.L., but don’t ask me to figure out what it means). A group of armed crooks breaks into a vault somewhere on the outskirts of Jesustown, maybe near Buddhaburg, and finds a man chained in a cell. When they free the man, they unleash the hellish power of Hakaider (Yuji Kishimoto), an indestructible robot with a motorcycle and a turtle shell helmet. 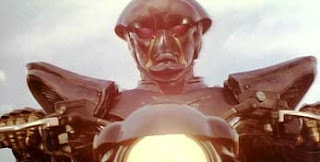 Hakaider immediately heads towards Jesustown and that means bad things are in store for King Girjev, who’s busy watching his lobotomized victims play with Legos and swooning over Mikhail’s mechanical package. Hakaider raises all hell when he arrives in Jesustown but Girjev’s forces are able to neutralize him. He’s rescued by criminal cutie pie Kaoru (Mai Hosho) and her band of merry outlaws. Recently, Kaoru has been having prophetic dreams of black knight coming to her rescue and taking her away from the Parliament’s corruption. Unfortunately, Girjev again catches up with Hakaider and his new friends and offs them with a million bullets. But Hakaider, the predecessor to Mikhail who was banished because he displayed tendencies of free will, isn’t going down so easily. He must first confront Mikhail, Girjev’s other terrifying robot monstrosities, and Girjev himself, a villainous, feathery pistol-packing demon who makes Michael Jackson look like Chuck Norris. 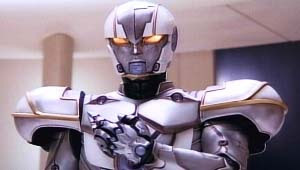 Then, and only then will Hakaider prove that he is a friend to all children. Most American audiences might associate the Japanese costumed-adventure shows called tokusatsu with Mighty Morphing Power Rangers. And most Americans might assume that these shows are purely for kids. But the fact is that tokusatsu is an enormously popular genre in Japan with dozens of such shows, movie spin-offs, and thousands of toys. 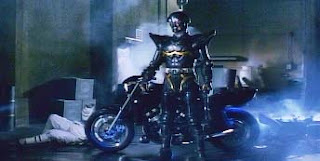 Hakaider, the brooding motorcycle-riding hero of a futuristic world, was the star of one such show, though I’m led to presume that it aired under a different title on Japanese TV. 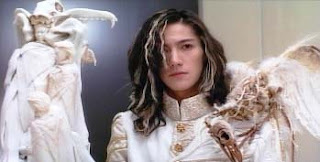 His first film spin-off is directed by Keita Amemiya, a man responsible for many crazy action-fantasy films such as Zeiram, Kamen Rider J, and Moon Over Tao, all of which at some point will be reviewed on another themed-month of Tremendo Time (hint, hint). 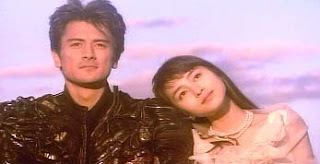 Hakaider is similarly crazy and action-filled, but hampered a bit by some silly over-seriousness. An attempt at a jab at Christianity is made, as there’s plenty of religious imagery such as twisted Christ and Virgin Mary statues to be found as well as the obvious Jesustown setting. But if Amemiya wanted to explore such weighty subjects in a genre film, he should have expanded more on the idea of free will, Hakaider’s primary conflict. He’s not presented here beyond a typical silent but deadly action hero, and his drive for vengeance seems a bit hollow. Missed opportunities aside, the costuming is unique and well-done, and reversing the archetypal white=good and black=bad was a fairly sporting idea. Although most of the supporting cast is forgettable, they all put in serviceable performances and are backed up by fast-paced action. Hakaider is a movie that could have brought depth to a genre plagued by the kiddie factor, but in its defense, it’s still a pretty good watch, a decent Japanese sci-fi actioner that’s well done and relatively satisfying.